"The Goldenrod Crab Spider spends much of its time patiently waiting, front legs extended inside or concealed just beneath a flower. When a suitable prey insect lands, the spider swiftly grabs it and pierces it with small fangs right at the neck. Paralyzing venom keeps the insect immobile but with the heart pumping. The unwilling insect is forced to pump its lifeblood straight into the spider." That is CRAZY! Great capture! Love that Ella went out shoot with you. Can we hire her some week ends? Haha! If it's any consolation, I'd say this bee had already been dead for a long time. 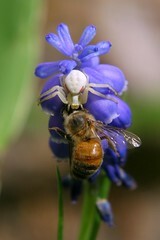 I think the spider was actually trying to get rid of it so it could use to hyacinth to await its next victim. Yeah, Ella was a great photo buddy. She really enjoys it -- I'll ask her if she wants to do some weddings with you this summer. Holy Cow! That is amazing and a great capture!